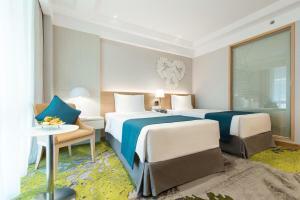 Located across Bangkok Central World Plaza and Gaysorn Plaza, Holiday Inn offers luxurious rooms with excellent services. Situated 500 metres away from Siam Paragon and Platinum Mall, It has a fitness centre, a pool and 3 dining options. Situated in Bangkok's shopping and entertainment district, Holiday Inn Bangkok is directly opposite Erawan Shrine and a 5-minute walk from Chit Lom and Siam BTS Stations. Suvarnabhumi Airport is 33 km away. Spacious, rooms are well-equipped with air conditioning, cable TV and a private bathroom complete with a hairdryer. They are carpeted and have warm lighting. 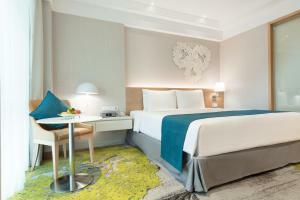 Select rooms offer panoramic views of Bangkok. Lazy days by the pool and relaxing massages await guests at Holiday Inn Bangkok. Guests can also make use of the modern fitness centre and the sauna facilities. Air-conditioned room offers a cable/satellite TV, a seating area and an en suite bathroom. Rate: THB 3360.57 ... THB 11416.90; select dates below to get current rates.